A 47-year old man presented with a history of intermittent dizziness over the previous two days. No chest pain. BP = 110/60 mmHg at the time his initial ECG was obtained (Figure-1). How would you interpret the rhythm? Is this an example of the Ashman phenomenon? 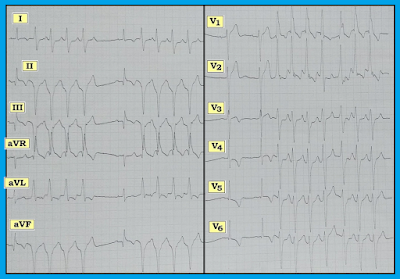 Is there any clue to a possible etiology for this patient’s arrhythmia? Figure-1:Initial 12-lead ECG obtained from a 47-year old man with dizziness for 2 days. What is going on? NOTE — Enlarge by clicking on the Figure. Interpretation: The ECG in Figure-1 is divided into 2 parts, with each part displaying 6 simultaneously-recorded leads for a monitoring period of 5 seconds. We begin with assessment of the rhythm. PEARL: When the arrhythmia in front of you is complex, with more than a single element — Look first to see IF there is an underlying rhythm! Question: Is there an underlying rhythm in Figure-1? If so — Can you tell what the rate of this underlying rhythm is? NOTE: For clarity — we have labeled the beats, and added RED arrows over selected atrial activity (Figure-2). Figure-2:We have numbered the beats, and added RED arrows to Figure-1, to highlight atrial activity in several leads (See text). Rhythm Assessment: There are 2 different shapes of QRS complexes in this tracing. The narrower QRS complexes are followed by short runs of wider beats. That said, the underlying rhythmis sinus — as suggested by the presence of an upright P wave with fixed PR interval preceding beats #1 and #6 in lead II. We see 2 sinus beats in a row in lead V1. The R-R interval between beats #1 and 2 in this lead suggests an underlying sinus rate of ~70/minute. NOTE: It is often extremely helpful to determine the underlying sinus rate when looking for clues to the etiology of a complex arrhythmia (as we will see momentarily). In the limb leads (ie, leads I,II,III; aVR,aVL,aVF) — each sinus beat is followed by a run of 4 fairly (but-not-completely) regular wide beats at a rate of ~150/minute. In the chest leads, following 2 sinus beats — there is a run of 8 wide beats. It is more easily apparent that this 8-beat run is not completely regular. Question: Are the runs of wide beats VT (Ventricular Tachycardia)? Or, do these runs reflect SVT (SupraVentricular Tachycardia) with aberrant conduction? 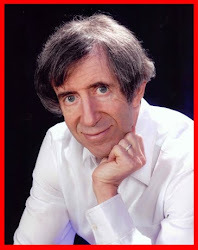 Is this the Ashman phenomenon? Are the WCT (Wide-ComplexTachycardia) runs VT? Many criteria have been described for distinction between WCT rhythms that are due to VT vs SVT with either preexisting BBB (Bundle Branch Block) or aberrant conduction. We summarize the approach we favor for distinction between VT vs SVT with aberrancy or preexisting BBB in our ECG Blog #42. We highlight some key points from Blog #42 in the bullets below. Monomorphic VT is usually a regular (or at least fairly regular) rhythm. That said, there clearly may be some irregularity with VT. Appreciation of the general rule that VT is usually at least fairly regular, is helpful — because the presence of a completely irregular rhythm would strongly suggest AFib (Atrial Fibrillation) rather than VT. QRS widening may be seen with AFib due to preexisting BBB — aberrant conduction — or WPW (Wolff-Parkinson White Syndrome). That said, despite irregularity for portions of the WCT runs in Figure-2 — the overall rhythm for these WCT runs is still regular enough in most places to be consistent with VT. Our feeling is therefore that the regularity of the rhythm in Figure-2 is not helpful for determining its etiology. On the other hand, QRS Morphology for the wide beats in Figure-2 — strongly suggests VT! The WCT run in lead V1 (ie, beats #3-8 in this lead) is consistent with a RBBB (Right Bundle Branch Block) pattern that could be supraventricular. And, there is enough of a wide terminal S wave in both leads I and V6 to also be consistent with RBBB. However, there is extreme axis deviation in the frontal plane (in the form of all negative QRS complexes in each of the inferior leads). Lack of any r wave at all in either lead I or lead aVF qualifies as “extreme” axis deviation — and this finding is highly suggestive of a ventricular etiology. Resemblance in the above noted leads to a RBBB pattern suggests that this is a Fascicular VT, with origin near the left posterior hemifascicle. Statistically, VT is far more common than wide tachycardia due to a supraventricular etiology. Especially in view of extreme axis deviation for the wide beats in this case — the WCT runs in Figure-2 should be assumed VT and treated accordingly until proven otherwise. NOTE: There is 1 more clue in Figure-2 that virtually confirms our impression. 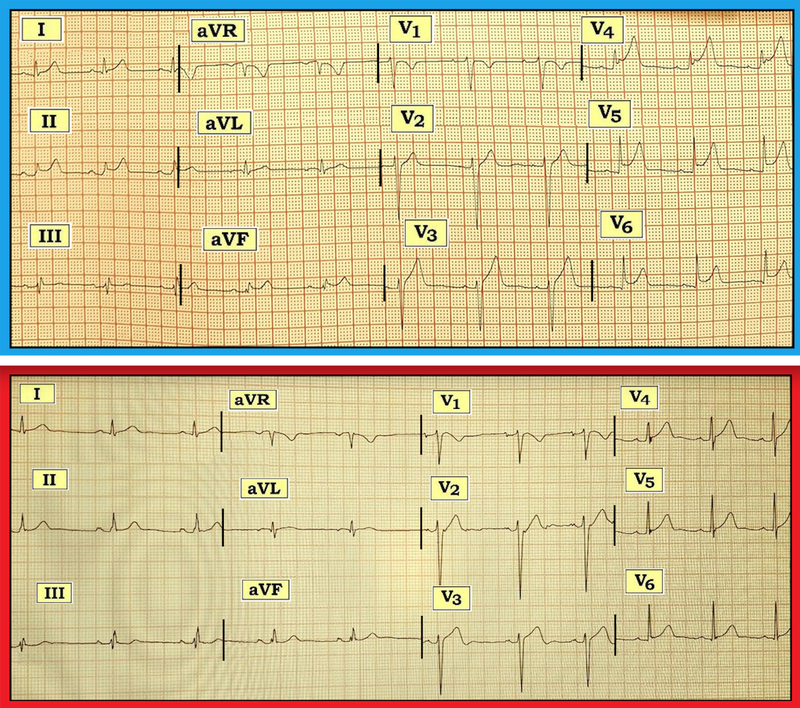 AV Dissociation: AV Dissociation is said to occur when “on time” P waves are not related to neighboring QRS complexes. This phenomenon may be transient (occurring for as little as a single beat) — or persistent (as occurs when there is complete AV block). The diagnostic value of recognizing AV dissociation in a WCT rhythm — is that it virtually proves the rhythm to be VT, since if “on time” P waves are not being conducted to produce the regularly-occurring wide complexes, then these wide beats must be arising from below the AV node (See ECG Blog #133). The problem is that most of the time when confronted with a WCT rhythm of uncertain etiology — the rateof the WCT will be too fast to allow us to reliably detect underlying sinus P waves. Therefore, you will not often see AV Dissociation in faster VTs, which are the VTs that challenge our diagnostic abilities. In our experience — AV Dissociation is overdiagnosed. 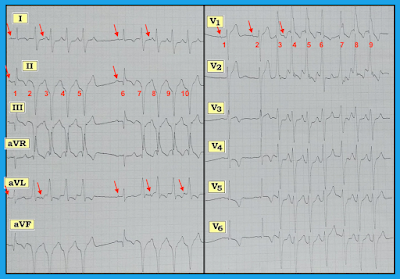 There is a tendency to think AV dissociation is present whenever one sees “extra deflections” in a WCT rhythm. The clinical reality, is that artifact rather than true AV dissociation is the usual cause of these deflections. As a result — we favor undercalling AV dissociation — and reserve use of this criterion for those cases in which we are convinced of its veracity. We believe AV Dissociation is present in Figure-2. 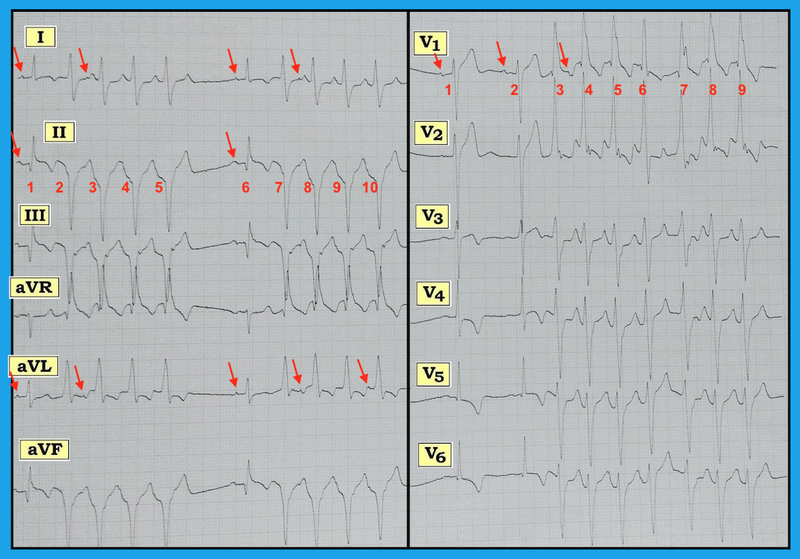 If so, this proves that the WCT runs are VT.
Recall how we emphasized the importance of identifying 2 sinus-conducted beats in a row — as we see for the first 2 beats in lead V1 (first 2 RED arrows in this lead). This tells us that the P-P interval for sinus P waves is just over 4 large boxes, which corresponds to an underlying sinus rate ~70/minute. Setting our calipers to precisely this P-P interval — the notch that is highlighted by the 3rd RED arrow in lead V1 occurs right on time! This 3rd P wave in lead V1 therefore manifests AV dissociation. That this is not due to chance can be seen in leads I and aVL in the limb leads, where on-time notching occurs after sinus P waves (RED arrows). Admittedly, we cannot “walk out” underlying atrial activity throughout the entire rhythm strip (You often will not with VT rhythms be able to “march out” underlying sinus P waves throughout the entire tracing) — but we feel the occurrence of on-time notching highlighted by the RED arrows is not due to chance. Is the Ashman Phenomenon present in Figure-2? The Ashman Phenomenon is based on the fact that the refractory period (and therefore, also the relative refractory period) is dependent upon the preceding R-R interval. Slowing of the rate by a relative pause in the rhythm will therefore lengthen the relative refractory period of the next beat. 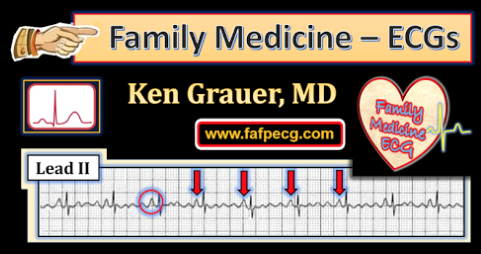 This makes it most likely that the 1st beat after a relative pause will conduct with aberration (See ECG Blog #70). In our experience — the Ashman Phenomenon is often misused. This phenomenon may be invaluable in the context of other clues that support a diagnosis of aberrant conduction. But it should not be used alone. In Figure-2, despite onset of WCT runs following a relative pause in the rhythm — the finding of extreme axis deviation + AV dissociation + lack of a premature P wave initiating the wide runs, combine to overwhelmingly favor VT as the diagnosis. Finally: There is 1 more component of Figure-2 that we have not yet analyzed. What is it? Answer: After assessing the cardiac rhythm — we need to evaluate sinus-conducted beats on this 12-lead ECG for possible acute changes. We therefore discipline our eye to focus on QRST morphology for beats #1 and 6 in the limb leads — and for beats #1 and 2 in the chest leads. All 3 inferior leads (II, III, aVF) show Q Waves, ST segment coving with slight elevation, and T wave inversion. Although lead aVL does not show reciprocal ST depression — it does show ST segment flattening, which is not quite normal. Our impression is that recent (possibly acute) inferior STEMI is likely. In the chest leads — the very deep S wave in lead V2 (nearly 25mm deep) suggests voltage for LVH. The takeoff of the ST segment in lead V3 is straight. It becomes coved in lead V4. Moderate-to-deep T wave inversion is seen in leads V3-thru-V6. This picture clearly suggests ischemia, which could be acute. NOTE: The above ECG findings that strongly suggest a recent or acute cardiac event provide yet another reason in favor of the WCT runs being VT — as VT is much more likely to occur than aberrant SVT in the setting of acute ischemia or infarction. FOLLOW-UP: It turned out that this patient had severe underlying coronary disease. The inferior infarction was found to be old — though there was no way to know this from assessment of this patient’s initial ECG that we saw in Figure-2. The runs of VT responded to medical therapy with amiodarone. Acknowledgment: My thanks to MG for his permission allowing me to use this tracing and clinical case. NOTE: The following blogs provide more information on topics mentioned in this case. Our approach for distinction between VT vs SVT with either aberrant conduction or preexisting BBB — See ECG Blog #42. 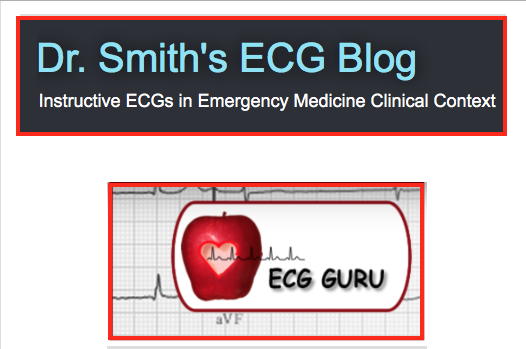 For review of the Ashman Phenomenon — See ECG Blog #70. 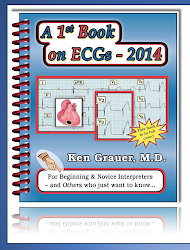 For review of AV Dissociation — See ECG Blog #133. 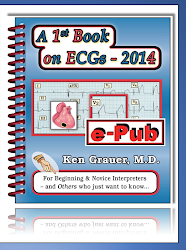 For review of Fusion Beats — See ECG Blog #128. A previously healthy 19-year old man presented to the ED (Emergency Department) following a syncopal episode. His initial ECG is shown in Figure-1. Are the ST-T wave abnormalities seen in this tracing the result of Early Repolarization? Or, is this likely to represent acute pericarditis? A CT angiogram was performed while the patient was in the ED. It was normal. Does this alter your diagnostic considerations? Figure-1: Initial 12-lead ECG obtained from a 19-year old man who presented to the ED with syncope. NOTE— Enlarge by clicking on the Figure. QRST Changes — An rSr’ complex is present in lead III. Tiny q waves are seen in leads I, aVL, V5 and V6. R wave progression is normal, with transition occurring between leads V3-to-V4. T waves are markedly peaked in multiple leads. In addition, multiple leads show upward-sloping (ie, “smiley”-configuration) ST segment elevation. There is no reciprocal ST depression. Acute Pericarditis — Features consistent with acute pericarditis include fairly diffuse ST segment elevation, with ST segment appearance in lead II resembling lead I (whereas with inferior infarction — lead II resembles lead III much more than lead I ). In addition, there is no reciprocal ST depression (as is typically seen with acute MI ) — and the relative amount of ST elevation in lead V6 is significant, as suggested by the ST/T ratio >0.25. That said — syncope is not a typical manifestation of acute pericarditis — and — T waves appear to be significantly more peaked than is usually seen with acute pericarditis. Hyperkalemia — There is no obvious reason for hyperkalemia in a previously healthy 19-year old man. In addition, the shape of the peaked T waves in this tracing are asymmetric (T wave upslope in many leads is much more gradual than is T wave downslope) — whereas with hyperkalemia, T waves tend to be much more symmetric and manifest a narrow base. Acute STEMI — Acute ST Segment Elevation Myocardial Infarction would seem unlikely in a previously healthy 19-year old, especially in the absence of chest pain. Acute STEMI usually produces more localized changes, rather than the diffuse ST elevation seen here. And, we are told that CT Angiography was done acutely and found to be normal. 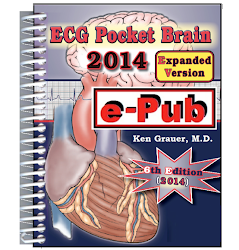 Early Repolarization — Early repolarization should always be a diagnosis of exclusion! While unusual repolarization variants are fairly common — the amount of ST elevation and the degree of T wave peaking seen here are clearly more marked than is generally seen with a simple repolarization variant. Acute Myocarditis— This can’t be ruled out on the basis of this single ECG — although the history is not suggestive of acute myocarditis. Something Else — Could we be missing something? The ECG was repeated a little bit later (Figure-2). 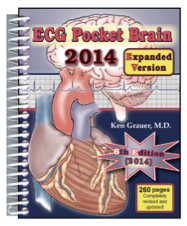 For clarity — we put the original ECG on Top (BLUE border) — and the follow-up ECG below (RED border). What has happened since the initial tracing was done? 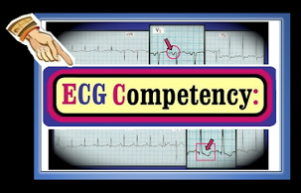 How does this 2nd ECG affect your diagnostic considerations? Figure-2: Follow-up ECG (RED border), obtained a little while after Figure-1. 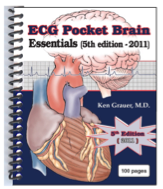 For ease of comparison — the original ECG is shown on top (BLUE border). What has happened in the interim? (See text). The amount of ST elevation in the follow-up tracing is clearly less in virtually all leads. T waves are not nearly as “peaked” as they were in the initial tracing. SUBTLE Finding: The terminal portion of the T wave in lead V3 appears to be turning negative in the follow-up tracing — whereas it was not negative initially. Could this reflect reperfusion? Follow-Up: Cardiac catheterization was performed. It revealed normal left ventricular function, clean coronary arteries — and, a myocardial bridge in the mid-LAD (Left Anterior Descending) coronary artery that was felt to be causing intermittent reduced blood flow. What is known about Myocardial Bridging? A myocardial bridge is said to be present when instead of its usual overlying epicardial location, a part of a coronary artery takes a “tunneled” intramuscular course under a “bridge” of overlying myocardium. Myocardial bridges may be “complete” (if the tunneled segment is completely surrounded by a band of myocardial muscle) — or “incomplete” (if only partially surrounded by a myocardial band). As a result of myocardial bridging — there may be intermittent dynamic compression of the artery by the involved myocardium during cardiac contraction. Autopsy studies suggest that myocardial bridging may be found in as many as 1/3 of adults. In most cases, there is little or no restriction of flow. As a result, the condition is usually benign. In fact, most cases of myocardial bridging go unrecognized — unless there is occasion to perform cardiac catheterization. That said — myocardial bridging sometimes is clinically significant. This is more likely to occur when conditions exist that enhance the amount of coronary artery compression. Clinically significant myocardial bridging is seen more often in heart transplant recipients, and in patients with hypertrophic cardiomyopathy (HCM). In this latter condition, a greatly hypertrophied left ventricle predisposes to development of myocardial bridging that might compromise coronary flow. It has been postulated that such bridging may contribute to the increased incidence of exercise-induced sudden death in the pediatric and young adult population with HCM. Myocardial bridges are most often detected by cardiac catheterization. The most commonly recognized location of myocardial bridging on cardiac catheterization — is in the middle segment of the LAD. That said, any artery may be affected. The usual size of the involved artery segment is between 1-3 centimeters. Males are affected as often as females. Atherosclerosis may or may not be associated with myocardial bridging. If present, atherosclerosis is most commonly seen just proximal to the bridged segment (probably due to generation of excessive shear forces). In contrast, the bridged artery segment itself is often free of atherosclerotic narrowing. As emphasized above — the overall clinical course of most patients with myocardial bridging is benign. However, it is important to realize that myocardial bridging may cause symptoms, including: i) acute coronary syndromes due to ischemia or infarction; ii) left ventricular dysfunction; iii) exercise-induced ventricular arrhythmias; and/or iv) sudden death. The mechanism of symptom production in patients with myocardial bridging is complex, and not completely understood. Symptoms sometimes appear out of proportion to the visible amount of flow reduction. Tachycardic states (including exercise or other cause of increased heart rate) may predispose to symptom production, because of disproportionate shortening of the period of diastolic ventricular filling. Whether vasoactive substances in the pre-bridged segment are involved is uncertain. Recent years have expanded assessment tools for detection of clinically significant myocardial bridging. In addition to cardiac catheterization — recognition of the presence and likelihood of clinical impact may now be evaluated by IVUS (IntraVascular UltraSound) — assessment of FFR (Fractional Flow Reserve) during cardiac catheterization — Cardiac CT (Computed Tomography) Angiography — and even stress echocardiography. TREATMENT: Medical therapy is 1st-line treatment for symptomatic myocardial bridging. Drugs of choice include ß-Blockers and non-dihydropyridine calcium channel blockers (ie, Verapamil; Diltiazem). The theoretical basis for use of these drugs is the negative chronotropic and inotropic effect that they have. In contrast, Nitrates are contraindicated — as they appear to accentuate systolic compression of bridged segments. If symptoms directly attributable to myocardial bridging persist despite optimal medical therapy — additional options that should be considered include surgical myotomy — coronary bypass surgery — and/or stenting of the tunneled coronary artery segment. BOTTOM Line: Although not a common cause of acute ischemia/infarction — it is good to be aware of the possibility of myocardial bridging— especially when symptoms arise in a younger adult not expected to have coronary disease. The diagnosis in this case was not picked up by CT angiography — and would have been missed had cardiac catheterization not been performed. Recognition of dynamic ST-T wave changes on serial ECGs performed in the Emergency Department were key to pursuing a definitive diagnosis. Lee MS, Chen CH: Myocardial Bridging: An Up-to-Date Review: J Invasive Cardiol 27:521-528, 2015. Möhlenkamp S, Hort W, Ge J, Erbel R: Update on Myocardial Bridging: Circulation 106:2616-2622, 2002. Onan B, Onan IS, Bakir I: Left Anterior Descending Coronary Artery Muscular Bridge: Texas Heart Inst. J 39: 598-600, 2012.